"Boston, 1984. Even in a world without cell phones, messages come through loud and clear if one is listening. When thirty-something Nora Forrest traveled to Manhattan to see a Broadway play starring her idol, an aging Irish actor named Hugh Sheenan, she doesn't know whether what happened in the theater that night should be credited to witchcraft, extrasensory perception, synchronicity, or simple accident—and she knows that many people would have told her nothing had happened at all. Revealed through the voices of just four people, Gillyflower is a story about intersections and connections—real, imaginary, seized, and eluded. It’s a book about everyday magic, crystalline memory, and the details that flow through time and space like an electrified mist. 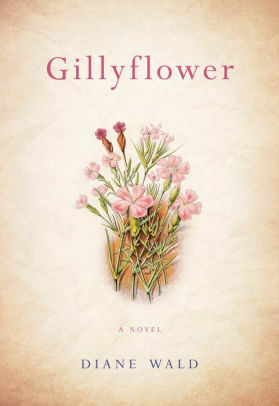 Gillyflower is a detective story, a love story, and a coming-of-age story—for the never really young and for the almost old. " Diane Wald was born in Paterson, New Jersey, and has lived in Massachusetts since 1972. She holds a BA from Montclair State University and an MFA from the University of Massachusetts, Amherst. She has published more than 250 poems in literary magazines since 1966. She was the recipient of a two-year fellowship in poetry from the Fine Arts Work Center in Provincetown and has been awarded the Grolier Poetry Prize, The Denny Award, The Open Voice Award, and the Anne Halley Award. She also received a grant from the Artists Foundation (Massachusetts Council on the Arts). She has published four chapbooks (Target of Roses from Grande Ronde Press, My Hat That Was Dreaming from White Fields Press, Doublle Mirror from Runaway Spoon Press, and Faustinetta, Gegenschein, Trapunto from Cervena Barva Press, and won the Green Lake Chapbook Award from Owl Creek Press. Her electronic chapbook (Improvisations on Titles of Works by Jean Dubuffet) appears on the Mudlark website. Her book Lucid Suitcase was published by Red Hen Press in 1999 and her second book, The Yellow Hotel, was published by Verse Press in the fall of 2002. WONDERBENDER, her third collection, was published by 1913 Press in 2011. She lives outside of Boston with her husband, Carey Reid, and their charismatic cats.